In a few days, DS will go back to school...although our temperatures are still very warm, this always feels like the official end of summer. 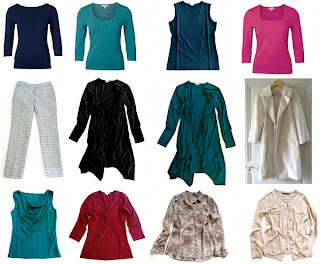 It is a good moment to recap, and while looking back onto the spring and summer posts, I've gathered the capsule pieces which were part of them into two looksheets... one consisting of old trusted staples, and one with this year's new additions. Love this kind of posts, my dearest MaiTai! Thank you also for the good wishes for DS's rentrée. After nearly three months of summer holidays, I hope he still remembers how to spell school! I am bookmarking this! This is absolutely fabulous....getting so many great ideas here! Happy to hear, thanks so much! 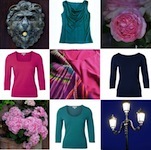 Have you seen new collection of H scarfs Jeux Divers?? 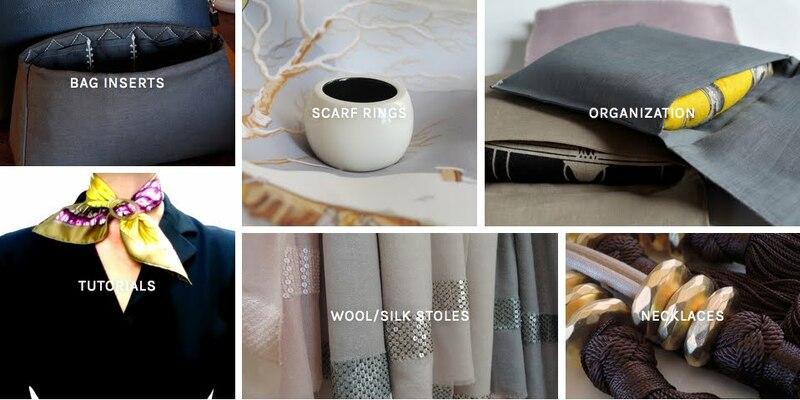 Love this with all your wonderfull style&colour ideas in one place. Loving a bit of each colour post as I cant chose between them,as they are all fab. Would you be willing to share your attitude towards making an outfit? Do you study it or follow your inner feeling and "dress like that", always in a relaxed manner? First, I have the weather in mind, and then the occasion, or what kind of day lies ahead. The rest is partly down to how I feel (choice of soft or crisp materials, tone in tone or contrast, loose or structured shapes, casual or more dressed up etc), and partly inspired by images that come to mind. These images can be anything.. something I saw a moment earlier by looking out of the window, an evocative memory, a detail, a picture, a flower.. 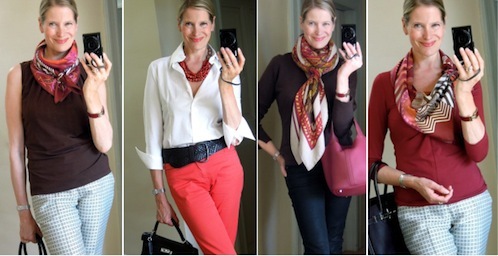 They often inspire color choices and combinations, and whenever possible, I try to capture them with my camera, and include them into the capsule wardrobe posts. 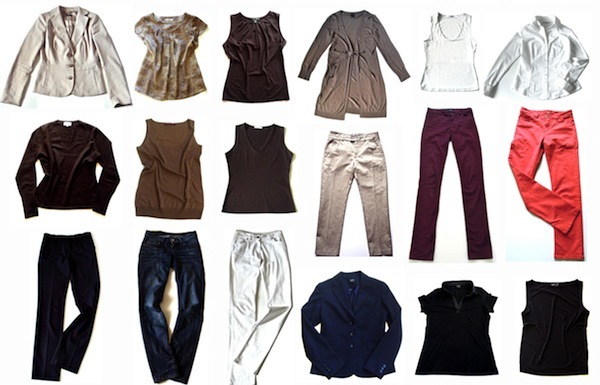 Do you always "know at the first glance" how to combine your outfit? Ohhh...I know the answer - you are such the "outfit magician", I know you are never in doubt. I am often in doubt. For example, I watched your new wardrobe additions (the post after this one) - for some of them, I might find a solution to "mix them" into my outfit. For others - your suggestions are the only solutions. Thank you, our dear magician. Oh, I'm late to the party. I wanted to add that I like the new colors that you've added to your summer wardrobe! And I love the photos from your birthday trip. It's clear that you were having such a wonderful time in Venice. Extremely practical collages that make everyday dressing easier. Big thanks! 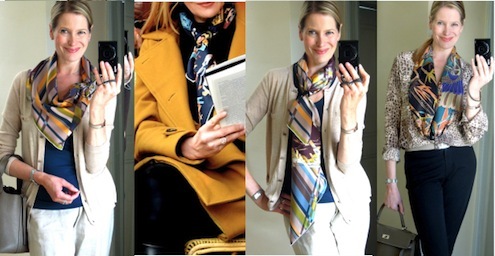 I don't know why I hadn't discovered your website before now, but I discovered your fabulous wardrobe and scarf styling photos on Pinterest tonight. I am loving your capsule wardrobe selections. 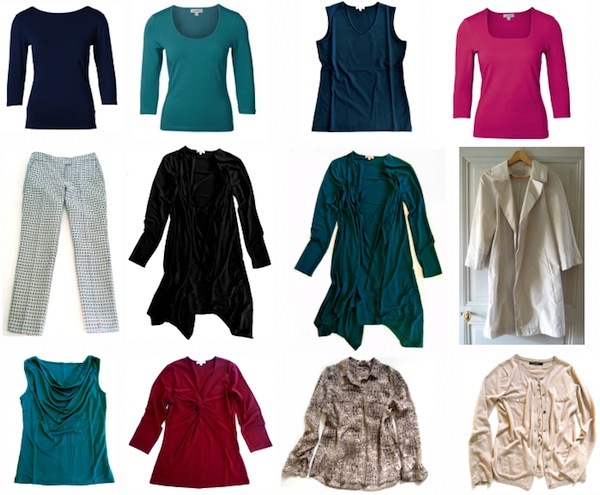 Especially your more colourful basics--navy, taupe, burnt orange, brown, with just a few basic black pieces are. I am a porcelain skinned auburn redhead who looks dead in black. It's frustrating to search for ideas on how to put together a classic yet luxe and dramatic wardrobe that isn't heavy on black. 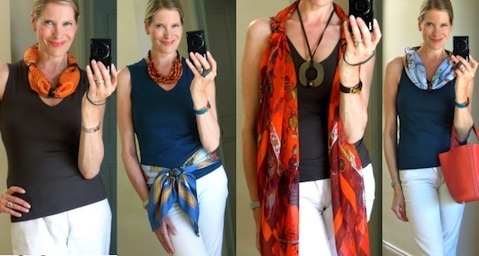 What I love best about your styling is your collection of gorgeous scarves. 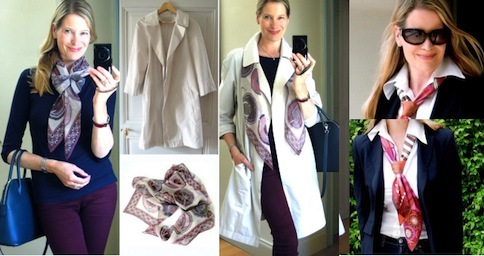 I also love scarves--I prefer tailored, simple pieces worn with beautiful scarves, handbags and jewellery. I have been looking for more interesting ways to wear my scarves. Your website is a breath of fresh air and inspiration for me. Merci!